This is a truly beautiful silver mounted Bohemian flash glass scent bottle. The tall white opaline body cut to clear glass with geometric patterns. The neck mounted with a simple and elegant plain hinged silver lid and fitted with a clear glass stopper. The inner lid with pale gilt wash. The silver lid is unmarked, which is quite usual with scent bottles, but tested as silver. Silver lid in good condition. Height: 11cm / 4.4 inches. Width: 3.5cm / 1.2 inches. Depth: 3cm / 1.1 inches. This is a fabulous solid silver Aesthetic movement scent bottle made by the highly collectable Sampson Mordan and dated London 1881. 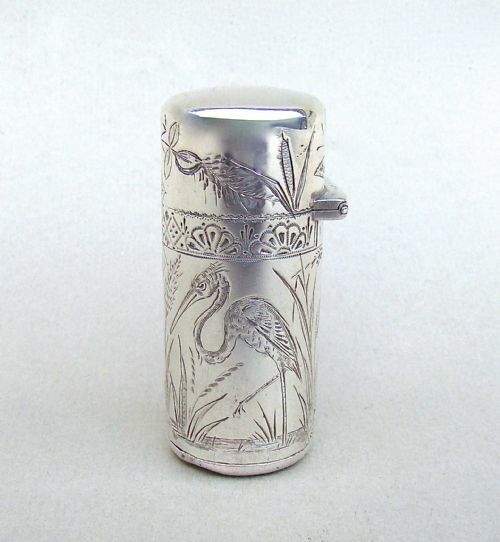 Of cylindrical form, it is finely engraved with Aesthetic movement motifs: a stork and butterflies amidst leafy bamboo shoots and pond landscape. SM&Co for Sampson Mordan & Co. Date letter "O" for 1889. Height: 5 cm / 2 inches. Diameter of base: 2cm / 0.5 inches. Good lid fit. Snaps shut. Inner glass in perfect condition. Glass stopper in perfect condition. Postage overseas: £15 International Signed For. To pay by credit or debit card over the phone or by cheque, please contact me on 01449 760 585. 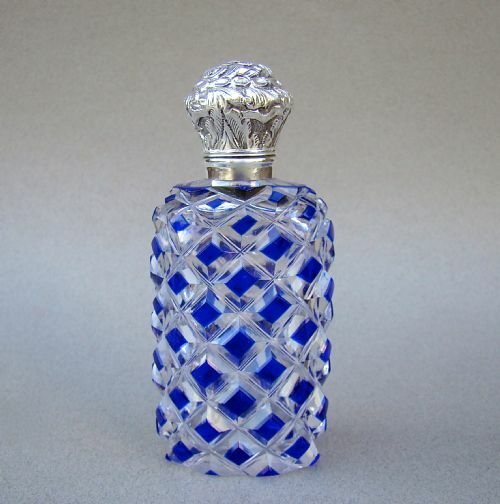 This is a tall and eye-catching silver and Bohemian Bristol blue glass scent bottle. The deep blue glass body hobnail cut to clear glass. The neck fitted with a stunning embossed silver lid. Unmarked, which was often the case with silver scent bottle lids but tested as silver. Height: 10 cm / 4 inches. Width: 4cm / 1.5 inches. Depth: 3cm / 1.2 inches. No holes to the lid. Glass body in very good condition. Inner glass neck in perfect condition. Postage overseas: £12 International Signed For. This delicate and rather delightful small silver, enamel and cut glass scent bottle is hallmarked for Birmingham 1913 and bears the marks of the prolific Cohen & Charles. The elegant and unusual lozenge-shaped glass body raised on a pedestal foot and fitted with a silver screw top lid. 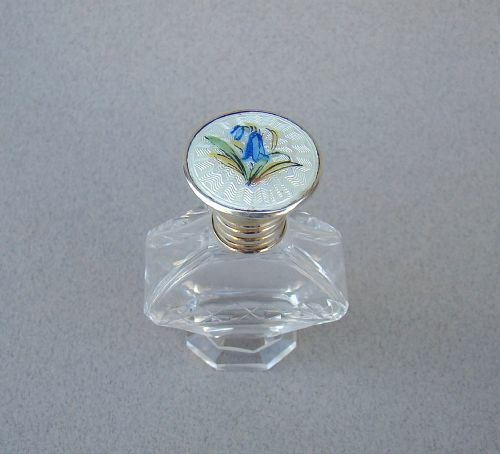 The lid inset with a cream guilloche enamel cabochon heightened with a blue flower. The neck fitted with the original stopper. C&C for Cohen & Charles. Date letter "o" for 1913. Height: 6 cm - 2.2 inches. Width: 3.5 cm - .3 inch. Tiny dent to silver lid. Glass body and glass neck in very good condition, minor flea bites here and there. Postage UK: £7 Special Delivery Next day. Postage overseas: £8.00 Standard parcel. 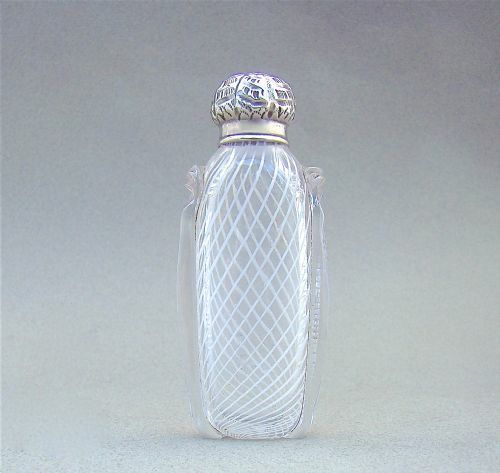 This exquisite and rather rare early Nailsea glass scent bottle dates circa 1840. The body with simple spiralling white opaque lines. There is high quality applied rigger work to the shoulders and sides with applied crimped glass. Fitted with a later Victorian silver lid. The neck with clear glass stopper. 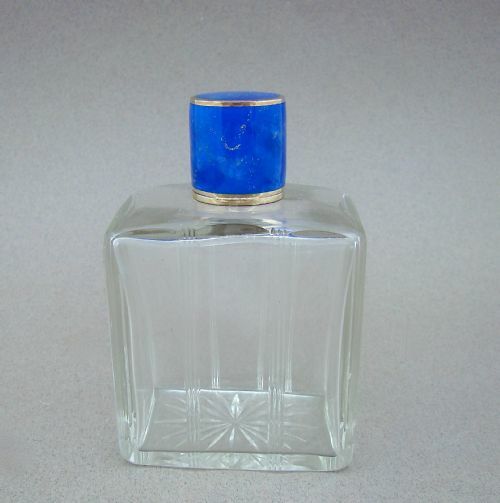 Unmarked as was very often the case with scent bottles but tested as silver. Height: 9cm / 3.4 inches. Width: 4cm / 1.4 inches. Depth: 2cm / 0.6 inches. Postage overseas: £10 International Signed For. 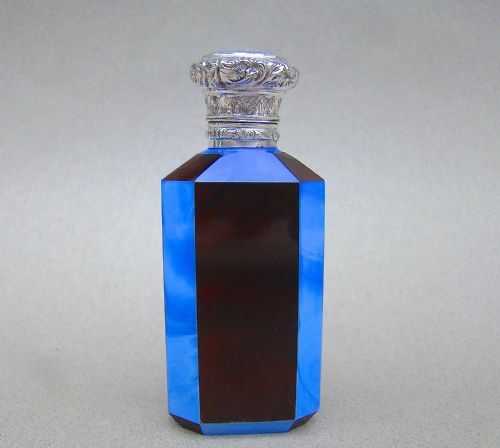 This is a stunning sliced-cut opaline Bohemian glass scent bottle. 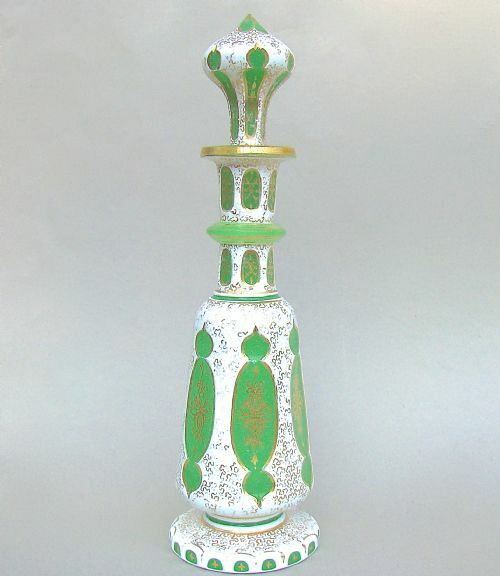 The white opaline body cut to green opaque glass with geometric patterns and heightened in gilt. The neck fitted with the original stopper. Raised on an elegant pedestal foot. Height: 24cm / 9.4 inches. Diameter at widest: 7cm / 2.6 inches. 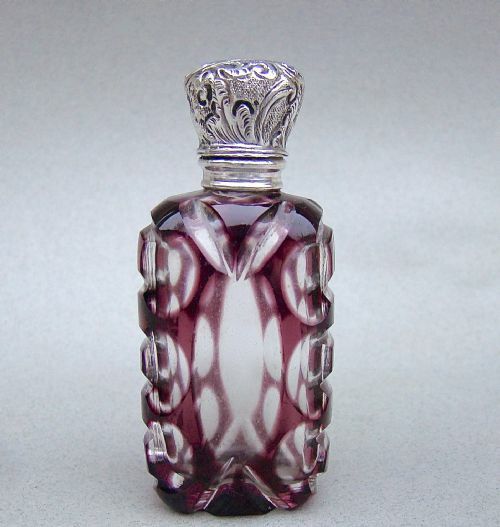 This is a beautiful silver and overlay crystal glass scent bottle in the very sought-after amethyst colour The body is cut to clear glass in geometric patterns and has a silver foliate embossed hinged top. The neck fitted with original clear glass stopper. Height: 7 cm / 2.6 inches. Width: 3cm / 1.2 inches. A little depression at back of lid. This is a very pretty and unusual 19th Century French silver lidded opaline glass scent bottle. 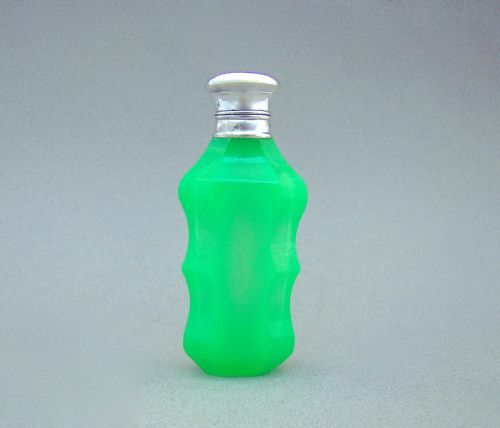 The vivid green opaline glass body of waisted form and mounted with a plain hallmarked hinged silver lid. French small guarantee silver mark (wild boar inside a lozenge) to lid and neck. Depth: 2.5 cm / 1 inch. Glass in the inner neck in good condition, no cracks. No holes to the silver li but a few dings and minor creases. This stunning silver and enamel scent bottle is dated London 1828. The silver banded blue enamel lid, imitating lapis lazuli, is inset with silver speckles. 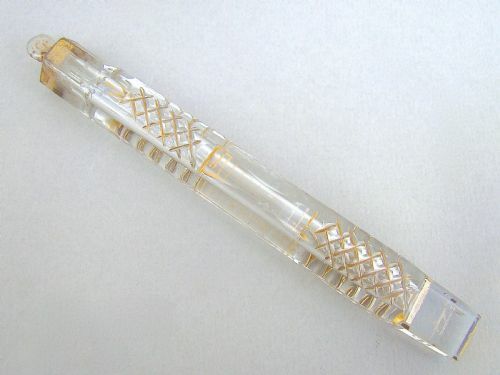 The stylish rectangular clear glass body with silver gilt neck and sliced-cut with vertical lines. Fitted with original glass stopper. Date letter "B" for London 1928. Enamel lid in excellent condition. Height: 10cm / 4 inches. Width: 6.5cm / 2.4 inches. Depth: 4.5cm / 1.6 inches. Postage UK: £8.00 Special Delivery Next day. Postage overseas: £12.00 International Signed For. To pay by credit or debit card over the phone or by cheque, please contact me on 07947 998 435. The four faceted sides sliced-cut with criss-cross patterns and heightened with gilt. Fitted with the original gilt glass stopper. Width: 1.5cm x 1.5cm / 0.5 inches x 0.5 inches. Postage UK: £5.00 1st class. Postage overseas: £7.00 standard parcel. To pay by credit or debit card over the phone or by cheque, please contact me on 01449 760585. 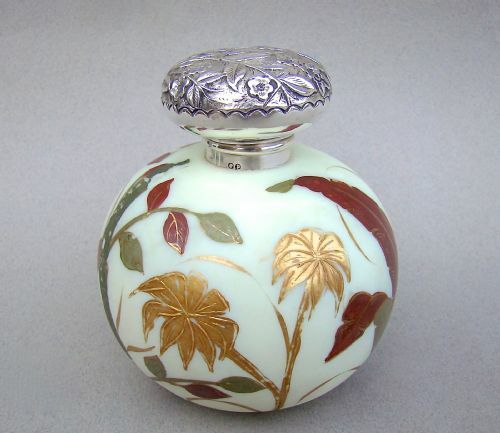 This is an exceptional French Lithyalin* glass scent bottle. The canted rectangular body sliced-cut in alternate panels of swirled blue and rich brown tones. The hinged silver top finely engine-turned and embossed with delicate scrolls. Fitted with the original, and rather wonderful, bi-colour stopper. Lithyalin* is a type of glass developed in Bohemia by Friedrich Egermann (1777-1864). It is opaque and has a marbled surface resembling semiprecious stones. Height: 8.5cm / 3.2 inches. Depth: 2 cm / 0.6 inches. Light surface age and use wear; minor dimpling to the lid. 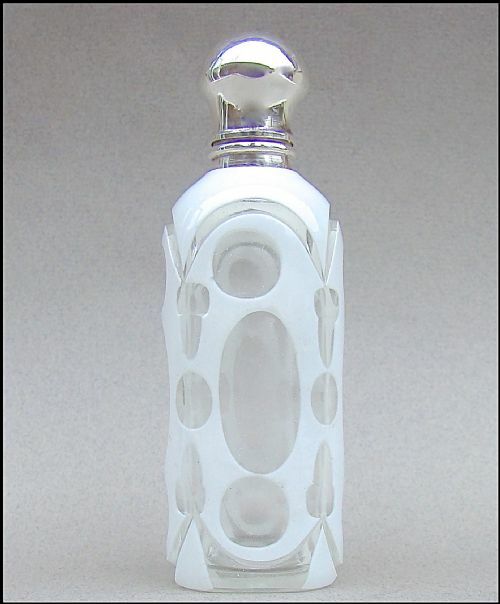 This is a rare and fabulous scent bottle by the celebrated Thomas Webbs. The spherical body a pale yellow satin glass is hand painted with a gilt spray of flowers and bamboos, inspired by the Japanese influence of the time. It is fitted with a n exquisite fully hallmarked hinged silver lid and comes complete wit its original stopper. Height: 9 cm - 3.4 inches. Minor recess on silver lid, barely noticeable, mentioned for accuracy. Glass body, glass neck in perfect condition.